We need alligators in our world to help curtail the rodent population and other animals that could ruin marshland vegetation. 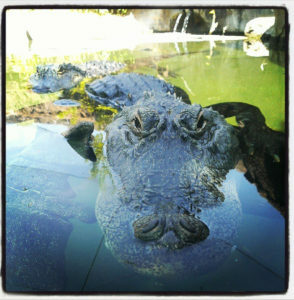 American Alligators are found throughout the southeast United States from the Carolinas to Texas and north to Arkansas. American Alligators are the largest reptile in North America. Conservation Status: The American Alligator was on the endangered list in 1967. The population was severely affected until protection laws were put in place. They were being killed for their belly skin that makes high- quality leather goods. After the laws were in place, the populations improved considerably. They were removed from the endangered list in 1987, but are still protected.